Brief Synopsis: Several of the missing heroes return to find the world a slightly different place than the one they left. Issue Notes: Booster reacts to news of Lex Luthor's Everyman Project. "Week 5, Day 1." 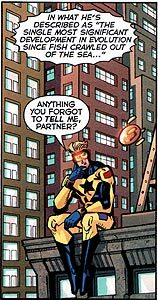 Booster Gold is surprised by the announcement of Lex Luthor's Everyman Project, leading Booster to confront Skeets about why he was not informed. 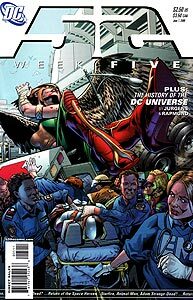 Boosterrific Review: Booster Gold’s role in this issue is small and irrelevant to the story within. Nonetheless, this is another worthwhile read, introducing the cosmic team that makes up the seventh major storyline of the series (following Booster Gold, The Question, Ralph Dibny, Black Adam, Steel vs. Lex Luthor, and the Science Squad). If it is possible to enjoy a comic book without Booster Gold, this should qualify.